Nelson Mandela, leader of the movement to end South African apartheid, is released from prison after 27 years. A member of the African National Congress (ANC), he advocated nonviolent resistance to apartheid, but became more militant after the 1960 Sharpeville Massacre, in which 69 unarmed demonstrators were gunned down by South African police in the black township of Sharpeville. In 1964, he was convicted of treason and sentenced to life on the brutal Robben Island prison. His resolve remained unbroken, and he led his fellow prisoners in a movement of civil disobedience that led to improved prison conditions. In 1989, F.W. de Klerk became South African president and set about dismantling apartheid. 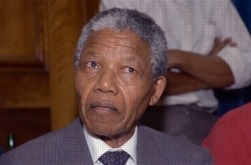 After his release, Mandela led the ANC in its negotiations with de Klerk’s government to end apartheid and in 1994 was elected South Africa’s first black president.